WASHINGTON (July 17, 2009) -- During a ceremony July 16 at the Pentagon, Chief of Staff of the Army George W. Casey Jr. shared thoughts about the man who has served as his boss for more than two years. Outgoing secretary of the Army, Pete Geren, served as secretary since March 9, 2007. Before an audience of several hundred Army officers, enlisted, and civilian employees, Casey recognized Geren's character and humility. 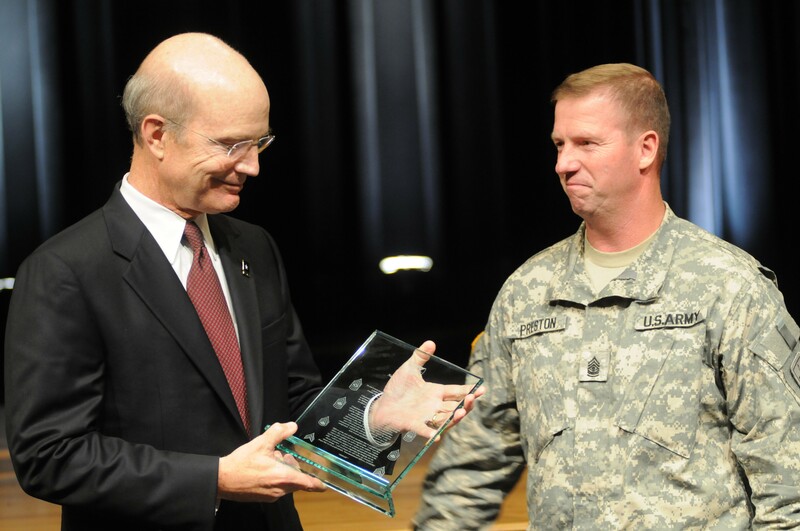 Secretary of the Army Pete Geren receives a plaque featuring the Army's Noncommissioned Officer Creed from Sgt. Maj. of the Army Kenneth O. Preston, during a ceremony July 16 at the Pentagon. The ceremony honored Geren as he prepares to leave his job as secretary. Geren served the Army beginning March 9, 2007, as the Army's 20th secretary. "He's a man of character and he is a man of integrity," Casey said. "But it really struck me -- and he'll tell you, 'I never served, I was never a Soldier.' He was apprehensive whether he would be accepted into our ranks." But the general went on to let the outgoing secretary know that his devotion to the Army and to Soldiers, and his belief in Army ideals, had endeared him to those he served. "As I've watched you, you are the quiet professional that we all aspire to be," Casey said. "We like to do the hard, right things. We like to do them to an exacting standard that makes us feel like we've done the right thing. And we like to do it without a lot of arm waving. And that's what I saw with you. And so Pete, you're one of us. You may not think that, but you're one of us -- the quiet professional." Casey credited Geren for initiating efforts to curb sexual assault and suicide in the ranks and for developing programs such as the Army Family Covenant, the Army Community Covenant, and the Year of the NCO. Both Casey and Sgt. Maj. of the Army Kenneth O. Preston took turns at the podium to let Geren know the effect he had on the force. Preston highlighted key contributions made by the secretary to Soldier and family well-being. "The secretary's concern for our Soldiers and families took him to posts, camps and stations around the world," Preston said. "He wanted to look our Soldiers in the eye and hear their stories of success and understand their concerns first hand." Preston said he accompanied the secretary around the Army to visit Soldiers in Warrior Transition Units, a new construct developed to facilitate the transfer of injured Soldiers back into the force or into civilian life. "In every case, the secretary met personally with Soldiers and their families," Preston said. "In very open and candid discussions, he wanted to understand how we as an Army are doing in caring for their immediate and future needs in all aspects of their lives -- not just medical." Preston also focused on the development of both the Army Family Covenant and the Army Community Covenant. "Both of these initiatives are a legacy of support that will endure with the Army throughout our history," Preston said. Preston also touched on the secretary's contributions to development of the noncommissioned officer corps. During his time as secretary, Geren was responsible for directing Army and national attention to the contributions of noncommissioned officers by designating 2009 as "the Year of the NCO." Part of that effort was to increase career development of NCOs. "He committed his support to additional funding for new initiatives, and at our request, his support of accelerating the implementation of existing NCO development initiatives," Preston said. One of those initiatives, the NCO career tracker, is now on course to test as a pilot program for the Army in November, Preston said, with full implementation expected in 2010. "It'll provide lifelong learning opportunity for all Soldiers regardless of rank," Preston said. Finally, Preston addressed the secretary directly -- expressing his gratitude for the time they served together. "Sir, your contributions will live on in the annals of Army history," he said. "Your care, concern, mentorship and leadership will be missed. On behalf of approximately 430,000 NCOs from all three components: thank you." Geren himself took the opportunity to address the Soldiers he has served for more than two years, telling them he is impressed by their service and by the dedication of their families. "Working for Soldiers and families has truly been the most rewarding experience of my life, and I thank all of you for letting me work with you, it really has been a privilege," Geren said. Geren said his knowledge of the Army and Soldiers began his second week at the Pentagon, back in September 2001, when he served as a special assistant to the Secretary of Defense. With the terrorist attack on the Pentagon on Sept. 11, 2001, Geren said he began watching Soldiers. "That day I watched Soldiers go to the sound of that explosion -- and for nearly eight years, I've watched Soldiers," he said. "I've watched you go off to war. And I have watched your families stand with you every step of the way. I've been truly inspired by your service, by your capacious sense of mission, and humbled by the sacrifice of your families." The secretary likened the Army to a Norman Rockwell painting. "It's a world of unabashed patriotism, of humility, and selfless service," Geren said. "The Army is a cynic-free zone -- a world so different than the 'me first' culture that is so much of the world today. Working for you and with you, and for your families, has truly been the privilege of my lifetime. I thank all of you -- from the bottom of my heart -- for what you do, and thank your families for what they do. It is the Soldier -- Army Strong -- God bless you."